Short Pump Animal Hospital places high value on preventative care and wellness visits for pets of ALL ages. Regular physical exams are a key component in providing wellness and disease prevention for your pet and peace of mind for you. During an office visit our veterinarians will examine all your pet’s body systems (a full “nose-to-toes” approach) and will ask you questions about your pet’s behavior, appetite, exercise habits and regular activity. 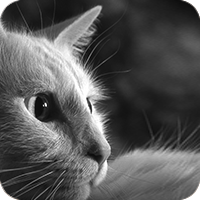 Depending on the pet’s lifestyle, age and particular condition additional testing may be performed. Treatments and/or vaccinations will be tailored to the needs of you and your pet. Vaccinations are an important part of protecting your pets against disease. We follow the current AAHA vaccination protocols which include distinguishing between core vaccines (always strongly recommended) and noncore vaccines (recommended due to certain other risks) for dogs and cats. 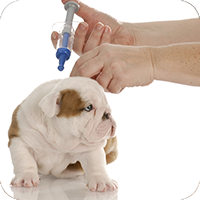 We will discuss the best vaccine regimen based on you and your pet’s individual needs. Have you found that your pet is experiencing any of the following: bad breath, decreased appetite, lethargy, drooling or discolored teeth? Do you find yourself turning your head when your little buddy comes for some bonding time? Your pet’s oral health can be impacting him or her in more ways than you know. Oral health is just as important in veterinary medicine as it is in human medicine. Periodontal disease can be very painful and may lead to heart disease, liver disease or kidney disease. 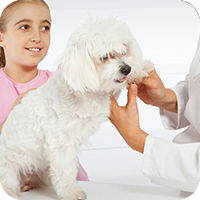 As part of each physical exam your pet will receive a complete oral exam. 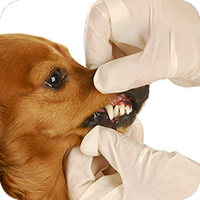 Part of your pet’s oral health plan may be the recommendation for a professional cleaning and/or specific treatments such as dental extractions or biopsies. Since preventative at home dental care is an integral part of maintaining good oral health for your pet our doctors and staff will discuss various dental care options to determine the best and most doable approach for you and your pet. Health exams and a series of core vaccines are of the utmost importance to get your new pet off to the healthiest start in life. Due to rapid growth and the uncertainty of immunity buildup, we recommend that you bring your pet in for physicals and vaccine updates every three to four weeks until sixteen weeks of age. This is the best way to ensure complete coverage and prevention of disease. Our veterinarians and staff will also use this time to speak with you about nutrition, husbandry, behavior, training, parasite prevention, and neutering. Taking on a new puppy or kitten is an exciting and challenging time. Know that our staff will always be available to answer any questions you may have. To ensure a long and healthy quality of life for an aging pet, appropriate senior care is extremely important. The fact that animals naturally tend to mask symptoms is a greater concern for senior pets because their condition tends to change more quickly. At approximately nine years of age, we recommend having a physical exam every six months. During a senior physical, the veterinarian may suggest further bloodwork, urinalysis, radiographs, or a dental treatment to improve the health of your pet. 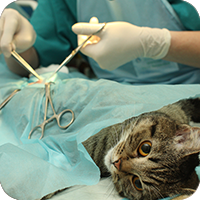 At Short Pump Animal Hospital, we perform routine spays and neuters as well as extensive soft tissue and many orthopedic procedures. We also offer a state-of-art surgical laser that can be used to reduce postoperative bleeding and swelling thus reducing postoperative pain. A full physical exam and pre-anesthetic bloodwork are performed prior to any surgery to provide a more complete assessment of your pet’s health. Anesthetic drugs and pain management are tailored to the procedure as well as the patient’s health. To ensure patients are kept safe under anesthesia, vital signs are closely monitored with physical observation and appropriate equipment to monitor blood pressure, respiration, temperature, heart rate, etc. 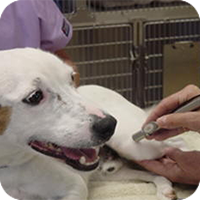 Each animal receives an IV catheter that allows for continuous IV fluid therapy as well as direct venous access. Follow up care is important to ensure your pet is healing appropriately so detailed discharge instructions are provided before your pet goes home and any postoperative questions or concerns are addressed promptly. Getting the right diagnosis means faster treatment for your pet so he or she will be feeling better as soon as possible. Sometimes issues can be diagnosed on the physical exam alone. However, some diseases require advanced diagnostics. Fortunately, we have access to several of these tools at our hospital to help diagnose your pet in a timely manner. Our in-house laboratory allows us to perform most necessary bloodwork in the hospital, resulting in quick results and appropriate treatment for your pet. Depending on the age and condition of your pet, other diagnostics may also be recommended. 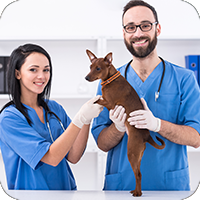 Other laboratory tests performed include urinalysis and internal/external parasite screening or more specialized blood tests sent to outside reference labs. We are proud to offer digital radiography, state of the art technology, to quickly and appropriately diagnose your pet. 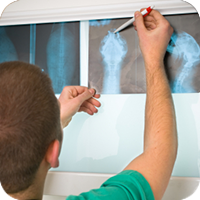 Digital radiographs are used diagnose orthopedic diseases (fractures, arthritis, congenital abnormalities) and soft tissue diseases (foreign bodies, heart disease, lung disease, urinary tract disease).These radiographs can be easily transferred to specialty/referral practices as needed. We also offer ultrasonography (often referred to as a sonogram), a noninvasive technology which is used to obtain a more complete view of internal organs. The hearing test known as Brainstem Auditory Evoked Response (BAER) is used to evaluate possible deafness in puppies and in adults. 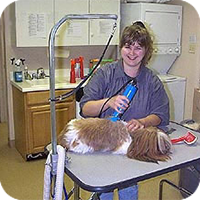 We are one of only a few full service veterinary hospitals in Virginia that offer BAER testing. Testing can be performed without sedation any time after 6 weeks of age. This is an excellent yet noninvasive way to identify deafness (unilateral or complete) in a puppy. Results are available while you wait. Occasionally further testing with a specialist may become necessary. If you need to have several puppies evaluated, our BAER test is a cost effective first step to avoid more costly evaluations with a specialist. For more information: BAER testing. Proper parasite control can be a matter of life or death. Parasites can affect you and your pet in a variety of ways, ranging from simple irritation to causing life-threatening conditions if left untreated. Some parasites can infect and transmit diseases to people. Fortunately, there are many effective means of protecting or treating your pet. It is fairly common for a dog or cat to become infected with an internal or external parasite at some point in its lifetime. Among the more common internal parasites are heartworms and intestinal worms. Heartworms are transmitted by mosquitos and cause damage to the lungs and heart. This disease can be fatal if left untreated. Fortunately, it is almost completely preventable with appropriate medication. We recommend year-round heartworm prevention to prevent your pet from contracting heartworm disease. More information can be found on the American Heartworm Society’s website heartwormsociety.org. Intestinal parasites can be transmitted through the soil, other animals’ feces or passed on through an infected mother. Some of these can also cause disease in humans, so ensuring your pet is free of intestinal parasites is very important. Monthly heartworm prevention also prevents infection by many of the more common intestinal parasites. External parasites including fleas, ticks, and mites can also transmit potentially serious diseases. 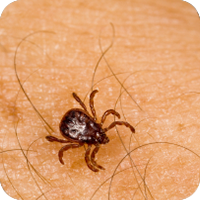 The incidence of Lyme and other tick borne diseases in Central Virginia has been increasing steadily. 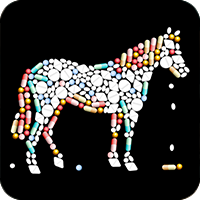 We offer oral and topical medications as well as collars to help prevent infestations with external parasites. We recommend testing for parasites annually so you can protect them and your family from potentially harmful parasites all year long. This also allows us to detect diseases early on. 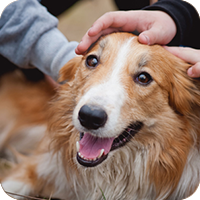 More information on parasites in animals, as well as disease prevalence maps, can be found on the Companion Animal Parasite Council’s website: petsandparasites.org. With our K-Laser, we can offer a pain-free and non-invasive treatment option for your pet. No anesthesia or shaving is required. We pass a laser beam across the area of treatment. 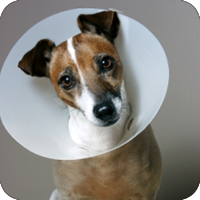 The beam stimulates healing in the treated tissue and is very soothing to your pet. Laser therapy significantly reduces the swelling and pain and speeds the healing process. Other benefits include better tissue repair and cell growth, improved blood circulation and better nerve function. For more chronic pain such as osteoarthritis, pets may require multiple treatments before seeing significant improvement in mobility and pain management. For more acute pain or swelling, improvement is usually noted within 24 hours. We suggest laser therapy for arthritis, muscle injuries, ligament and tendon injuries, sprains and strains, ulcerations and open wounds, post-surgical and soft tissue trauma, back pain and neuromuscular disease. For more information contact us or go to K-laser therapy treatment. When our pets hurt, we hurt. We strive to keep our pets as comfortable as possible in all stages of life. Unfortunately, signs of pain in animals can be hard to detect because animals mask illness and injuries to help protect themselves in the wild. It is easy to misinterpret signs of pain (decreased activity, decreased appetite, inappropriate urination/defecation, vocalization, decreased interaction with family, restlessness, hiding and aggression) as signs of aging or “slowing down”. A physical exam will help determine the source of the pain and what changes can be made to make your pet more comfortable as quickly as possible. Pain management may be in the form of medications, laser therapy, supplements or lifestyle changes at home. The chip is a rice grain sized electronic transponder placed under the skin that stores a number that is linked to a database. This database can be easily updated in the event of a move, phone number change, etc. Microchip placement can be done at any time for your pet but is most often done at the time of a young animal’s spay or neuter surgery. Our clinic takes care of the registration so your pet is protected right away. Learn more at www.homeagain.com. Nutrition plays a huge part in keeping our pets happy and healthy. Good nutrition enhances quality and quantity of life by helping prevent diet associated illnesses. Every pet has unique nutritional needs based on their age, size, breed, physical activity, environment and health concerns. We will discuss all elements that affect your pet’s nutrition to help decide on the best diet for your pet. You love your pet and want the best for him or her. When a pet has a behavioral problem, it can lead to serious consequences. Behavior problems can take a physical toll on your pet and can damage the relationship you two share. 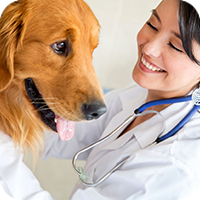 We will work with you and your pet to develop an approach that combines veterinary clinical medicine, behavioral medicine and pet training. 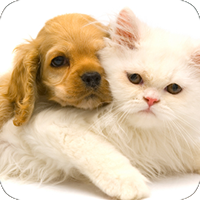 Our goal is to help pets and their owners live together happily, comfortably and safely. 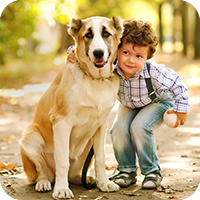 If you’re concerned about any aspect of your pet’s behavior contact us to schedule a consultation. We gladly welcome all sorts of animal pets. 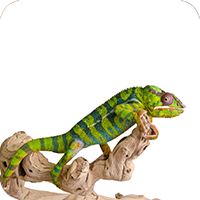 Exotic pets are among our many patients. We see guinea pigs, rabbits, hamsters, gerbils, chinchillas, hedgehogs, mice and even rats (but no lions, tigers or bears!). We also welcome birds and reptiles. Dr. Christine Morlino has years of experience attending to the health of exotic pets and guiding owners in feeding and caring for their pets. The decision to euthanize is difficult but often is the kindest final gift we can give to our beloved companions. Please know that the decision is always yours. We will be there to educate you as best we can about your pet’s condition and to support you through the decision-making process.